On the snowy afternoon of Friday December 15th, as THE BALLAD OF LEFTY BROWN was hitting select theaters, I was being ushered into a conference room to spend some time talking to the film’s director Jared Moshe and it’s star the legendary Bill Pullman. Over the course of some twenty five minutes we talked about the film, the western genre, Pullman’s career, theater and a few other things. It was a wonderfully cool experience and one of the high points of the film year. First we do discuss some plot points and the ending of the film. While the discussion could technically be considered spoilery, I don’t think it will ruin anything. I showed the interview to some friends and asked them what they thought and they said it was vague enough that it didn’t ruin anything. Secondly there is a discussion of the Broadway production of Edward Albee's play called The Goat, or Who Is Sylvia. If you are not a theater fan you might not be aware that the play rocked audiences back in 2002 with its examination of the nature of love via the story of a man in love with a goat. That may sound funny but it is in reality a shattering theatrical experience that many theater goers I know still talk about, particularly Pullman’s performance. Lastly I want to thank Layla and every one at Cinetic Media for making this happen. And I especially want to thank Bill Pullman and Jared Moshe for taking time out of their busy schedules to talk to me. The meeting began with the failure of my audio recorder and switching to my camera to record the meeting. As I fumbled to change recording devices Bill and Jared switched from talking about New York pizza and discussing Jared’s anxiousness at the film opening and the prominent placement of the reviews in the New York Times and LA Times. Jared Moshé: Yeah, I'm kinda nervous. Steve: You’re nervous because of opening tonight? Steve: Why? It's a fantastic film. Jared: Like, so it's like, "Oh yeah, that...it's like it's kinda perfect." "Oh, yeah. I'm intrigued by all these." Hey. Jared: The reviews have been really good for the movie. Steve: I was curious how they were and how they viewed the film some of the reviews I read seemed to not get what you were doing with references to the films of the 30’s and 40’s and the great sidekicks like Andy Devine, Froggy Burnette or Fuzzy St John. Jared: Manohla Dargis, her opening of her review is she recognizes that there's a line in the movie "Sorry, don't get it done," that comes right out of something John Wayne says to Walter Brennan in RIO BRAVO. And she picked up on that. She totally picked up on all of that sort of arc. Jared: ...which is just really incredible. Jared: Well, I was trying to find a human being behind that sidekick archetype. Whether it was, you know, Andy Divine, Gabby Hayes, Walter Brennan, you know, the list goes on and on, and on. Normally we just look at this type of character, , who we laugh at, who the other characters laugh at, who the hero laughs at. Yet, you know, in RED RIVER when John Wayne is about to be gunned down by three guys, it's Walter Brennan who throws in the rifle, and allows him to survive. You know, it's like that dichotomy of someone who the hero relies on to an incredible degree, and everyone laughs at. It's like trying to find that human being. Steve: Do you think that a character or ta a sidekick would be somebody like John Wayne would not have around if they were as big an idiot as they seem to be in the movies? Steve: ...or just the comic relief. Jared: No, he understands that there's value in what Lefty brings, and, you know, that doggedness, you know, and, uh, but he sees probably more in Lefty than Lefty sees in himself. Steve: Did you have input into the character? Bill: Oh yeah, yeah, it was great to collaboration with Jared. There was a sense that, uh, finding the character was going to be a collection of all these trials and tribulations he's gone through. And what, what he kinda, what gets revealed about him in the course of the journey, so. Yeah, right up to the end, and I think, we were aware of what did we leave everybody with, you know, with this. And the rule of law is clearly, you know, on Lefty's mind when he says, "You know, hanging this guy isn't exactly gonna look good for a senator." You know, at the top of the story, this hanging gets done. Even at the end with Jimmy, he wants to bring him to a jail. And then Laura says"You know, let's do it Eddie's way," and so we're going to take him to be hung, and that, that puts the characters in a crucible about what they decide about rule of the law. Steve: But even then, I think Lefty has a sense of justice. The thing that struck me with the film is the fact that Lefty carries out the hanging. I mean, even if he was absolutely intent on the rule of law I don't think Lefty would have kicked it over. Steve: But whereas the absolute sense of, "I have to do this. This is the justice.” This is the only way the governor is going to pay. Bill: Well, I think that almost more than justice is loyalty. And for him, his decision to do it is an act of loyalty to Edward, 'cause he's gonna save Edward's widow from being, you know, punished for a murder. So, beyond the rule of law, and beyond that sense of justice is, is that I'm gonna take the rap, 'cause she's determined he's gonna be hung, and "I'm gonna do it so she doesn't have to suffer." And that because of the loss of his friends and everything, in the course of the journey, all he has left is his loyalty. Steve: Bill the one feature you’ve directed is a western. Jared you've directed two Westerns…have you directed anything other than westerns? Steve: What is it that you guys find in westerns that they are the stories you want to tell? Bill: Well the one that I really want to do was The Virginian... which is still the real seminal Western story. John Ford said he based five of his movies off of aspects of The Virginian. The novel, written by Owen Wister in 1903, and that thing lit up the myth of the cowboy, and everything. So to do that movie is like to go back to the roots, which is Jared's instinct. You know, he's not a revisionist. He's like comes...he goes deep into the roots and he draws from all the old, oldest impulses, and why that is such an important part of, uh, cinema, an important part of the country's heritage. Jared: Yeah, for me it's, it's baked into our DNA. You know, and, you know, you have to embrace the sort of tyranny of the genre, and all the little tropes and almost clichés that make it such a wonderful genre that we understand so well. Westerns are tied to cinema, and it is such a wonderful canvas to tell stories on. the typical sidekick and characters but then you subvert them It’s things like Kathy Baker absolutely hating Lefty. You know, it's pure jealousy, if nothing else. I mean, Lefty hangs with her husband all the time. She never gets to see him. Jared: Well, it's like more than that, even. It's like she's his wife yet he goes off on all these things that she cannot, as a woman, get to go and do. Like, you know, so she's sort of stuck in this role, and meanwhile, this guy gets to go out on all these adventures that she probably knows, she do better. She could probably be a better sidekick, a better partner to her husband than Lefty ever could. And, you, there's a lot of anger there. She's really important, you know, as Kathy and I talked about it, she's the only woman in the movie. And she has to feel that she's the only woman in this world, and respond to that, and have the emotion of, be coming from an emotional place of what it is to be that person, to be that woman who's just, you know, surrounded by men. You know, maybe sees her best friend once a year, like, and how tough that is, and how tough that makes her. Steve: How did you view the mythic ideas of the genre? Jared: I mean, I love the myth, and I think the myth is fantastic, and even in subverting it, I do feel like I try to embrace the, the myth as value. Um, but I think you have to now, I understand that, like, there's a lot of warts on that myth, and you have to embrace sort of both sides of it, you know. I think we can see the value of the myths in the stories we tell ourselves, but, you know, we also have to say that we know that they're myths and know that they're not real. Steve: That sort of ties into this thing that I was thinking about on the train ride in. I just came from my day job and I was telling everybody I was coming to Bill, and everybody's talking about WHILE YOU WERE SLEEPING, and INDEPENDENCE DAY and every other of the films you were in. So you've created all these iconic characters. They are in their way just as mythic as the characters and archetypes of the west. What I wanted to know was how you find that living up to that? How does that affect you? How do you react to, you know, people would come to say, "I know you. I know you from WHILE YOU WERE SLEEPING" or whatever? Bill: Yeah, well I'm always amazed that certain movies kinda get recycled and hang in there. I never even thought that WHILE YOU WERE SLEEPING would be a Christmas movie, and that's a kind of become a family tradition. Its odd to think families say, "Oh yeah, we sit down after/before Christmas every year and watch WHILE YOU WERE SLEEPING, and I thought, "I don't know if that..." But then I remember, oh yeah, there's all this stuff around the snow, and the tree... and the orb. And yeah, so that's, uh, you know, it's just such a fortunate thing to have. But you realize how movies, how strong they are for people when you get to stick around for a few decades. Steve: Are you coming back to Broadway or New York theater? Bill: Oh it's really always such a good pleasure to get back to New York and do plays, and things, and I keep my eyes out, and I, and I just haven't found the right thing, so, but I'm definitely leaning in. Jared: …from The Goat. She was so impressed with everything. Bill: I’ll tell ya, on "The Sinner," the guy who's the show runner, Derek Simonds, his mother had seen The Goat, and was one of my first promoters, said, "You got to cast Pullman in this." So it's odd that a play would have that sort of an impact. I think I added up once that I thought I was seen by about 600,000 people, you know, which is like half of, uh, the audience of an opening night of a movie or something. Jared: ...than when I go to the cinema, just because there's the intimacy of the room. Steve: And it's happening right before you. Steve: There's nothing like that. Bill: Yeah, if it's a well-made play. Bill: The opposite is the worst experience that you can't ever forget. Steve: Are you going to direct more? Bill: Oh, that's an interesting good question. Well, I have been doing some theater pieces lately. I find that's easier to fit into my schedule. You know, I can kind of workshop pieces that I'm writing and then because I have interest in what we used to call docudramas, you know, basically devised theater. And I'm working on a piece now that involves my daughter. So, when I can get some time off, I usually do a workshop of that, and then I look to direct those, eventually? Steve: Jared are you going to do something other than Westerns? Jared: Yeah, my next project is not Western. I have a sci-fi script, and I'm developing some other stuff. But I'm gonna stay in genre. Steve: It's weird that in this day and age that somebody would direct two Westerns back to back. Jared: I think I should be directing more Westerns. Jared: People want to see them. Bill: You know, I think violent Westerns are, you know attention getting. I think Jared's courage is to tell, really a human tale. You know, a tale of loss, a tale of character, and their humanity, of people inside that, without them relying on guns in hands for, you know, most of it, and that kind of thing. I think that what's been surprising is that so many women have responded to this movie 'cause I think they aren't really needing to see another testosterone-driven, cruel we were or how violence is always in part of America, theme. You know that there's more to be toldwith the people out and characters from that time. Steve: This originally appeared on DIRECTV, and now it's going to theaters, was that purely financial or was that...? Jared: You know we had a ton of offers on the movie, but we really liked what A24 brought to the table in terms of getting the film in front of the broadest audience. And one of the things about a Western is that the audience is so much in these very rural, very isolated places, where even if they were to go to a multi-plex movie it's an hour and a half away. There may not be an Indie theater that is gonna play a movie like this, but, for them to see it on DIRECTV, allows more people to relate to the movie and watch it, which at the end of the day, you want people to watch your movie. Steve: ...you see you as Lefty, and you're thinking, "OK that upsets everything." Steve: I want you to get some awards because this is an iconic role. This is gonna be another one of your iconic roles, where everybody talks about it for years. I hope you get a lot of awards. 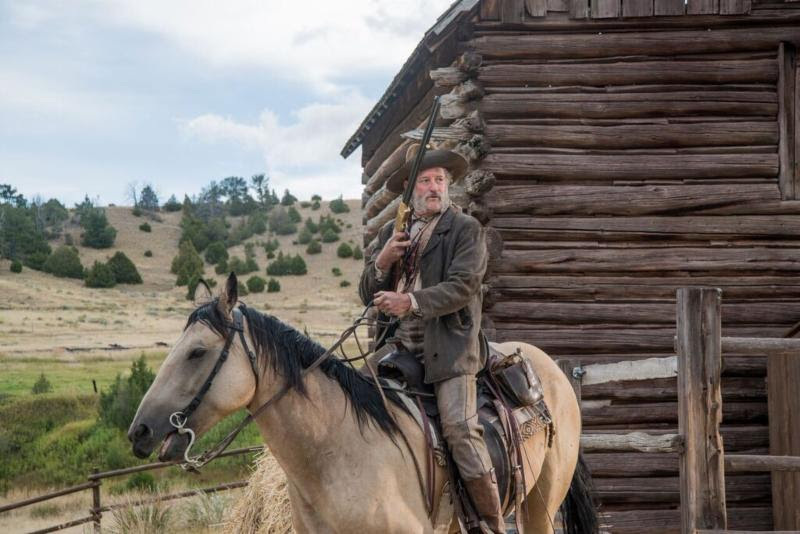 Bill: I don't know, it seems as though, uh, you know, there's always that question with Westerns whether the people give them the same… a few have kind of made it through...like "Unforgiven," and that kind of thing. Jared: There's a Western bias. Bill: There's a Western, yeah. Jared: People don't take them as seriously as... they're not taken seriously as much as like art cinema is, or other genres. Jared: Yeah, but that comes in, because that's like you have a last year's Best Picture winner, and...I feel like The Revenant was like everyone deciding like, "OK, Leo deserves an Oscar. We're going to get behind him." You know, like...If they come in with that kind of pedigree, then they can sort of vault over the fact that they're a Western... but I think if it's just you're presenting it as a Western, it can be tough. Bill: Mm-hmm, and this is like "Get Out," in that it's also humorous. Bill: It's a curious, uh, beast, yeah. Steve: Well, it starts off, and you think it's one thing, and then once you're on your, your quest, it becomes something else. It's like a lot of, the humor's still there, but it becomes very serious, and everything has this really dark edge to it. Bill: Mm. So good Steve that you, uh, that you enjoyed it and really liked the film. Bill: I feel like it is something off or something very different from what's out there right now. Steve: Yeah, it's just better than most of the other stuff out now. Jared: I'm glad that it stays with you because I want, you know, you want people to think about it and talk about it. Jared: Please, spread the word. Thank you so much. Jared: Thank you so much. Steve: Well, thank you all.